The latest version of Microsoft Excel has not been universally welcomed. The interface is a radical change and the new file format can create interoperability and sometimes performance issues. This has created a market for alternative solutions. Most of these look uncannily like the previous incarnation of Microsoft Excel (Excel 2003). 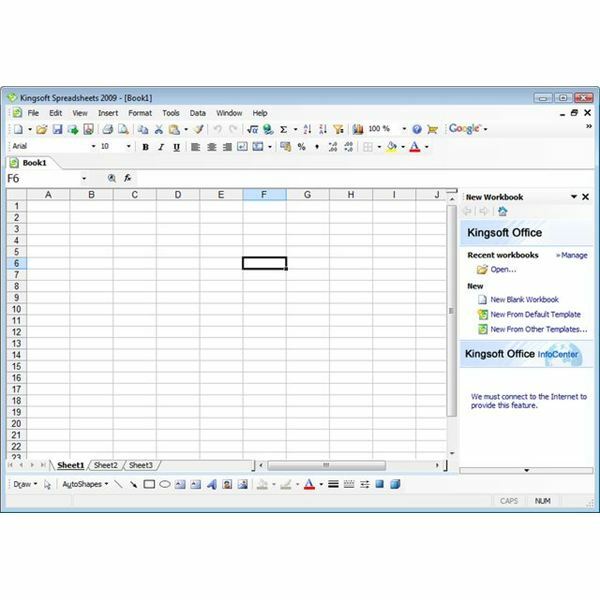 In this article, we shall review the spreadsheet component of Kingsoft Office, which looks uncannily like Microsoft Excel 2003. The first impression of the software is its uncanny resemblance to Microsoft Excel 2003. To get a sense of this look at the screenshot. It is quick to load both the application and an .xls spreadsheet file. The menu structure has the same headings as Excel 2003, but there are less options on those menus. This brings simplicity of use, but also means that some features of the Microsoft product are missing. The handling of .xls files is seamless and rapid and Acrobat (.pdf) files are also available directly. However, the overall choice of file formats is smaller than in Excel, and users of historical Lotus spreadsheets would have to use an intermediate format such as csv, or dbf, which is supported. The application has a reader for .xlsx files but no export facility. Whilst I am not sure why you would want to export files in this format, the import facility might be needed. It is currently in beta, and I confess I lacked the confidence to try it after my experience with .docx files. Most of the most commonly used features are present, including wizard like facilities for tasks such as chart production. The most significant omission in this area may appear to be the restriction to 2-d charts. However, 3-d charts, whilst attractive are not the best way to display data, and have been criticized by a number of academic authors, including Anna Hart in Making sense of statistics in health care, so this omission may well be a blessing in disguise. The very useful Autosum and AutoFill features from Excel are reproduced here, as are a healthy range of statistical and analytical functions. The inclusion of an inbuilt Google search facility is a nice touch, but less obviously useful than in the other elements of the suite. Compared to Excel 2003, the application is current and offers the prospect of ongoing support. It loses a few features. In the case of this element, I am sure that the absence of three dimensional charting will be the most obvious omission, but I regard this as a victory for substance over style. Once again, it offers the ability to write directly to pdf formats, which Excel 2003 does not. Compared to Open Office v3, it looks more like Excel 2003, loads more quickly and opens .xls files more quickly. It is not free for commercial use, but offers support in compensation. Finally compared to Excel 2007, it offers speed and simplicity of use. Its functionality, although less than Excel 2007, is more than adequate for most users. It offers an alternative upgrade path from Excel 2003 which is much less expensive and disruptive than Excel 2007. Overall, this is an excellent spreadsheet application and a viable alternative to both Open Office Calc and Microsoft Office Excel. I am sure some users will miss three dimensional charting, but speaking as an academic information manager, this omission will save them from themselves!